I felt disappointed the first time I saw The Woods, director Lucky McKee's follow-up to the brilliant May. I'm glad I gave it another chance, because I think I was wrong about this one. Though he has made a number of variations on a similar theme -- the world can be a cruel and unforgiving place for women -- Lucky McKee has never made the same movie twice. May is a beautiful, off-kilter character study, while The Woman is a savage and heavy-handed commentary on gender politics. All Cheerleaders Die is his candy-colored teen movie. His sophomore effort The Woods is his Gothic film, more interested in place and atmosphere than in character or even plot but no less eccentric than his other work. Agnes Bruckner plays Heather, a troubled teen shipped off to the Falburn Academy boarding school by her distant parents in 1965. 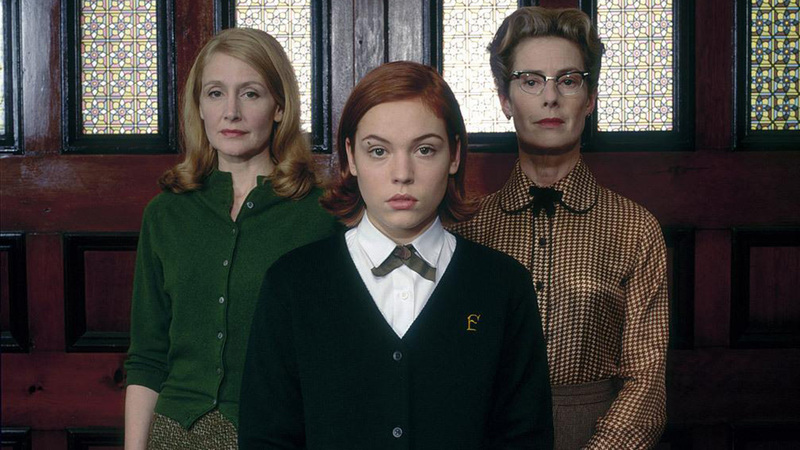 There she befriends shy Marcy (Lauren Birkell) and suffers torment at the hands of school bully Samantha (Rachel Nichols), all while undergoing special "tests" administered by the dean, Ms. Traverse (Patricia Clarkson), who explains it as a condition of Heather's scholarship. As strange occurrences become more and more frequent -- girls disappearing, nightmares of murder -- Heather begins to suspect the teachers at Falburn of practicing witchcraft. Though witchcraft movies are low on my list of favorite horror subgenres, I'm happy to have initially misjudged The Woods. Having seen only McKee's May at the time The Woods was released (essentially straight to DVD, at least in my region), I think I didn't know what to make of how different his second film was from his first. It's easier now to contextualize the movie within his larger body of work and, free of those damned expectations, I can appreciate how beautifully made The Woods really is. It's his moodiest film, filled with shadows and darkness and things we can't see lurking just outside the frame, but it also features so many of the little touches recognizable as his signature -- the dreamy montages set to pop music (in this case period pop), for one, or his fondness for dissolving images into one another. Things begin falling apart the deeper into the movie we get. Maybe it's because this is the only Lucky McKee movie he didn't have a hand in writing; the screenplay is credited to David Ross, whose only other credit is as the writer/director of the mostly terrible The Babysitters from 2007. Or maybe it's just a function of these kinds of supernatural movies, where things eventually have to be explained when the mystery is so much more compelling and satisfying. I like that McKee is never afraid to cut loose in his climaxes, though, and this one is no different -- tree people, axes swinging, Bruce Campbell vomiting up black goo and tree bark. That way we can at least have a visceral response to what's happening on screen even if it doesn't make a ton of sense from a narrative perspective. 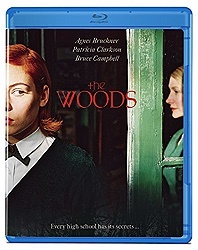 If it wasn't for Olive Films' new Blu-ray release of The Woods, I don't know when or if I would have revisited the movie. I'm glad I did. It might be Lucky McKee's best-looking and most technically accomplished film -- all the more reason to be thankful it's now available in high def. Now if only we could talk someone into getting May out on Blu-ray. Buy The Woods from Olive Films here. I actually saw The Woods on the THIS Chicago affiliate channel just a few weeks ago. I loved the third act's "go for the gusto" attitude even if it belongs in another movie. The performances are all solid but it seems more like it was set in 1985 than 1965. I may want to see the Blu Ray since it was clearly & heavily cut for the TV broadcast. Geek Alert: It's Rachel Nichols who plays Samantha. I'm a big Continuum fan so I have to stand up for her.